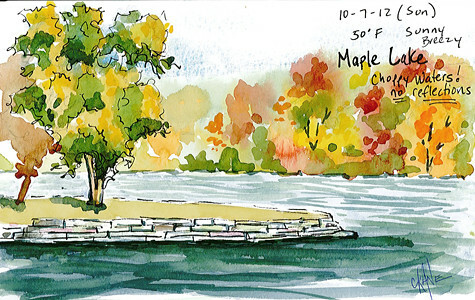 Maple Lake Watercolor Sketch – Let's Paint Nature! A blustery day this was as I sat in my car and sketched from the parking area. I was waaaaay under dressed to be sitting outside for an hour painting. It was very windy, so windy that the waters were choppy and there were no reflections on the lake. Sometimes even a quick get-a-way will just do the trick. I sat alone without the radio and thought about many things. Silence is therapeutic even if it is a little scary sometimes. It forces you to face your reality and actually feel it too. Feeling things sometimes hurts, but the faster I face it the faster I can move on. And I so need to move on. I want to send out a big thank you, for all of your well wishes, prayers, and thoughts. To see the scheduled meetup locations for the new sketch group click here. So, maybe the micron pen is applied to the trees in the foreground and a little to other shapes in the foreground (sparingly)? Yes! I only did the one tree and some of the stones. It really adds a good pop. Nothing in the background. Yes, sometimes when it is too cold out or don’t have much time, sketching in the car works perfect! Thank you!!! So glad to hear this. 🙂 I like the water you’ve created on this page. Thanks! Water is fun esp those wavey lines! Lovely sketch and colors, Christine. The waters may have been choppy, but for me, your sketch radiates tranquility.